Poa is a tussock forming grass, probably not as drought tolerant as Themeda. 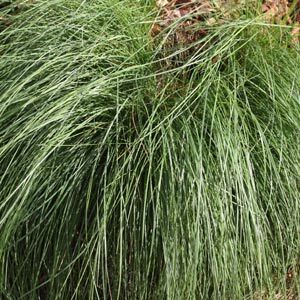 However it is very useful in areas where it will get water during winter, and will withstand the dampness that other grasses will not. A number of forms are available from specialist growers with Poa labillardieri ‘Suggan Buggan’ being widely available in the wholesale nursery industry. Great in low lying areas that may accumulate water in winter. Poa will cope with a hot summer. Generally reaching around 50cm in height forming a dense clump, many varieties have uses in landscaping and well as erosion control and roadside plantings. Good in coastal conditions and fairly hardy once established. Poa can be pruned back to 10 – 15 cm to help new growth and maintain a tidy appearance. P. labillardieri is one of the most commonly grown species, attractive flower heads in summer and though the year make it suited as border plant. Reaching around 80cm in height and forming a clump to 3m across. P. poiformis is the Coastal Poa, excellent in coastal conditions. This is a tussock forming species that will reach around 1m in height forming a clump of a similar width. P. sieberiana is commonly called ‘Grey Tussock Grass’ as well as ‘Snow Grass’, lower growing to around -5m in height, again, tussock forming and flowering in late spring to early summer. P. fawcettiae – This variety is also known as Snow Grass and Horny Snow Grass, low growing to around 15 to 25 cm with flower stems to 60 cm in height. Attractive blue green foliage. P. helmsii – A broad leafed variety suited to damp or boggy conditions. Also known as the Broad Leafed Snow Grass. Varies in height from around 20 cm to 7o cm depending on conditions. Tall flower stems to nearly 1.5 metres. Pale green flowers from summer to autumn. P. meionectes – Low growing to around 60 – 70 cms.